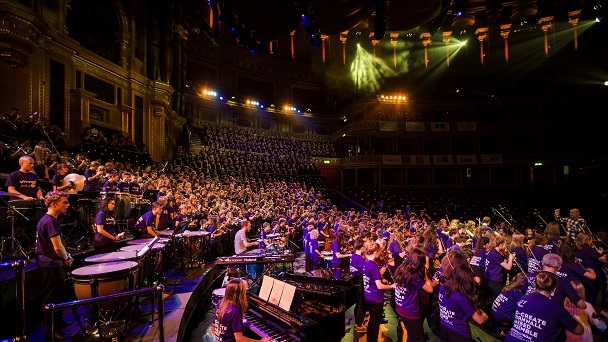 For three nights, 23-25 November 2015, Music For Youth takes over the Royal Albert Hall and presents 3000 young musicians in the Music for Youth Proms. Each night 1000 young musicians take part in a concert like no other: full-scale symphony orchestras are showcased side by side with some of the best jazz bands, chamber groups, rock bands and choirs from across the UK. And each night a Massed Ensemble of over 500 musicians performs new work, specially commissioned for this occasion, with Martin Read's Mary Rose, The Mighty Sky based on work by Beth Nielsen Chapman, and Russell Hepplewhite's 800 Miles as the Albatross Flies. On Monday 23 November, Hampshire Music Service presents Mary Rose, a composition project by Martin Read involving choir, orchestra, new music by local students, drama and dance. The piece is based on the story of the Mary Rose – Henry VIII's ship – a local story representing the various aspects of the tragic circumstances surrounding the ship’s sinking in the Solent. On Tuesday 24 November, The Mighty Sky Choirs and Orchestra features musicians from Kirklees Music School, Daventry Music and Performing Arts Centre and Chiltern Music Academy for a visual and musical spectacular. Involving over 350 young people, the project created to inspire and expand their understanding of astronomy. The Mighty Sky album by Beth Nielsen Chapman is at the heart of the project, a collection of songs bordering blues, country, folk and pop which has now been arranged for soloist, choir and orchestra.